I love Pesto; it is one of the pleasures of summer. I have included wikipedia’s information on the subject and then a few of my favorite recipes and resources! Pesto (Italian pronunciation: [ˈpesto], Genoese: [ˈpestu]) is a sauce originating in Genoa in the Liguria region of northern Italy (pesto genovese), and traditionally consists of crushed garlic, basil, and European pine nuts blended with olive oil, Parmigiano Reggiano (parmesan cheese), and Fiore Sardo (cheese made from sheep’s milk). The name is the contracted past participle of the Genoese word pestâ (Italian: pestare), which means to pound, to crush, in reference to the original method of preparation, with marble mortar and wooden pestle. However, the ingredients in a traditionally made pesto are not “pounded” but “ground” with a circular motion of the pestle in the mortar. This same Latin root through Old French also gave rise to the English word pestle. The ancient Romans ate a paste called moretum, which was made by crushing cheese, garlic and herbs together. Basil, the main ingredient of modern pesto, likely originated in North Africa; however, it was first domesticated in India. 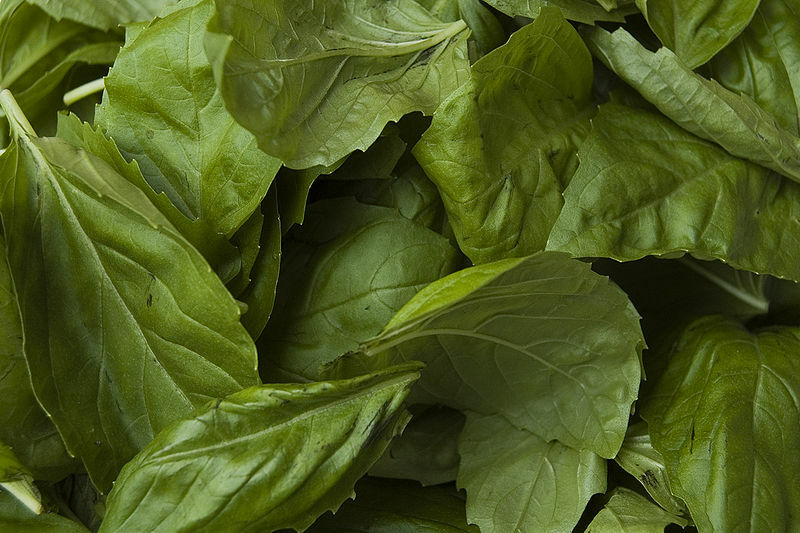 Basil took the firmest root in the regions of Liguria, Italy and Provence, France. The Ligurians around Genoa took the dish and adapted it, using a combination of basil, crushed garlic, grated hard cheese (a mix of parmigiano-reggiano and pecorino or just one of the two), and pine nuts with a little olive oil to form pesto. The first mention of recipe for pesto as it is known today, is from the book La Cuciniera Genovese written in 1863 by Giovanni Battista Ratto. In French Provence, the dish evolved into the modern pistou, a combination of basil, parsley, crushed garlic, and grated cheese (optional). However, pine nuts are not included. 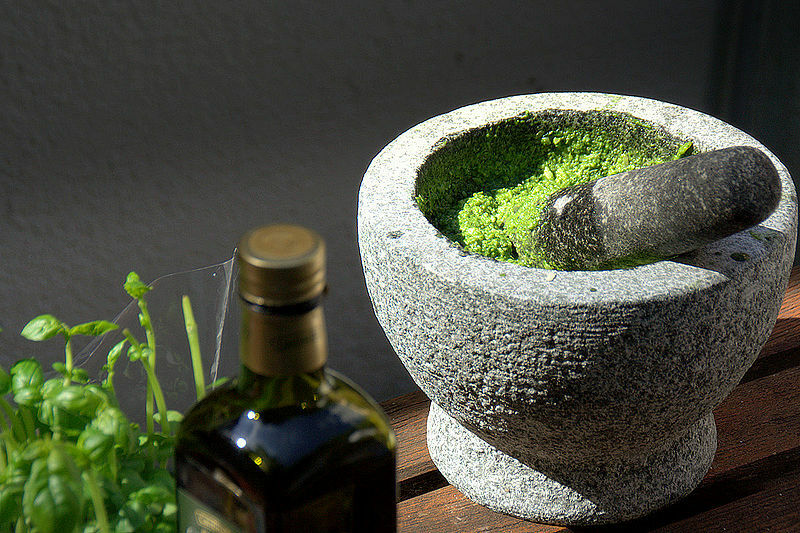 Pesto is traditionally prepared in a marble mortar with a wooden pestle. 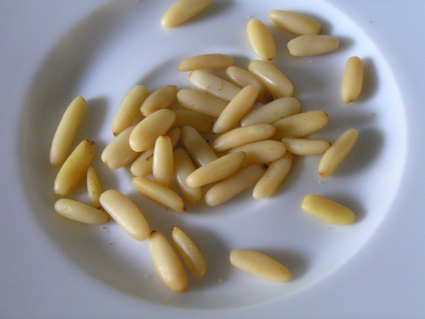 First garlic and pine nuts are placed in the mortar and reduced to a cream, then the washed and dried basil leaves are added with coarse salt and ground to a creamy consistency. Only then is a mix of Parmigiano-Reggiano and Pecorino added. 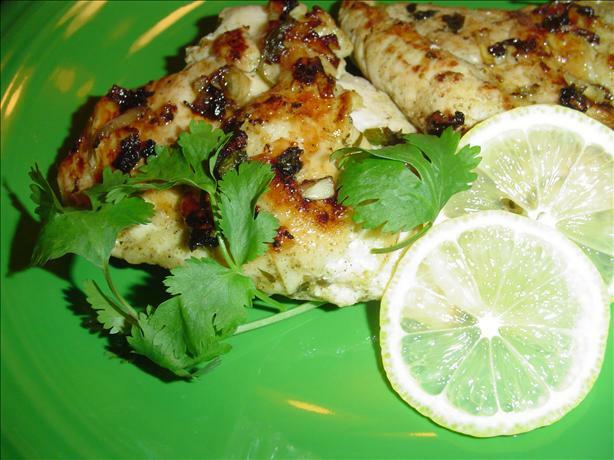 To help to incorporate the cheese a little extra-virgin olive oil is added. In a tight jar (or simply in an air-tight plastic container), covered by a layer of extra-virgin olive oil, pesto can last in the refrigerator up to a week, and can also be frozen for later use. Pesto is commonly used on pasta, traditionally with Mandilli de Sæa (Genovese dialect – literally “silk handkerchiefs”), trofie or trenette. Potatoes and little green beans are also traditionally added to the dish, boiled in the same pot in which the pasta has been cooked. It is sometimes used in minestrone. Pesto is sometimes served on sliced beef tomatoes and sliced boiled potatoes. Because pesto is a generic term for anything that is made by pounding, there are various other pestos, some traditional, some modern. For this reason, the original (and most common) pesto is now called pesto alla genovese or pesto genovese (both forms are used in both English and Italian), in order to help differentiate the original basil based pesto from alternatives. Pesto alla genovese is made with Genovese basil, salt, garlic, Ligurian extra virgin olive oil (Taggiasco), European pine nuts (sometimes toasted) and a grated cheese like Parmigiano Reggiano or Grana Padano and pecorino Sardo or pecorino romano). A slightly different version of the sauce exists in Provence, where it is known as pistou. In contrast with pesto genovese, pistou is, in general, made with olive oil, basil, and garlic only: While cheese may be added, usually no nuts are included. Pistou is used in the typical soupe au pistou, a hearty vegetable soup with pistou flavour. The sauce did not originally contain basil, however. Instead, cheese and olive oil were the main constituents. Pesto alla siciliana, sometimes called pesto rosso (red pesto), is a sauce from Sicily similar to pesto genovese but with the addition of tomato, almonds instead of pine nuts, and much less basil. Pesto alla calabrese is a sauce from Calabria consisting of (grilled) bell peppers, black pepper and more; these ingredients give it a distinctively spicy taste. Outside Italy, the household name “pesto” has been used for all sort of cold sauces or dips mostly without any of the original ingredients: arugula (instead of or in addition to basil), black olives, lemon peel, coriander, or mushrooms. A German variety uses ramson leaves instead of basil. In the 19th century, Genovese immigrants to Argentina brought pesto recipes with them. A Peruvian variety, known as “tallarines verdes” (meaning green noodles, from Italian tagliarini), is slightly creamier, lacks pine nuts (because of their rarity and prohibitive cost in Peru), may use spinach and vegetable oil (in place of olive oil), and is sometimes served with roasted potatoes and sirloin steak. Lots of industrially made Pestos use cashew nuts. 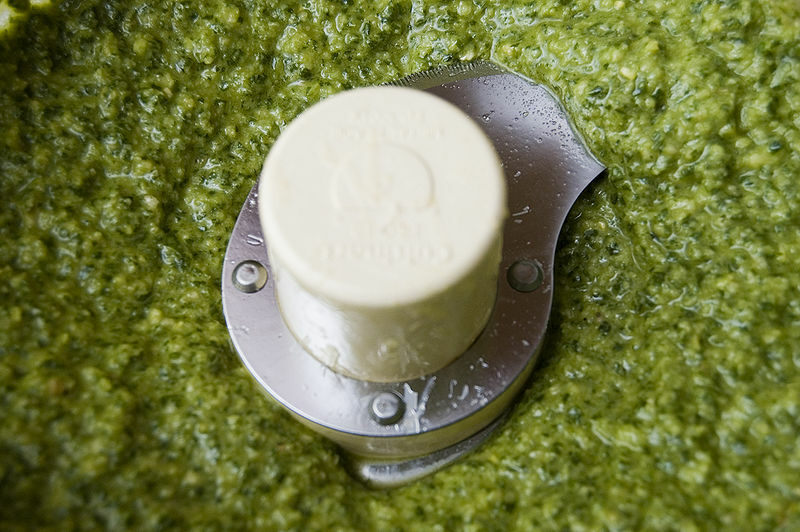 Pesto in the US is commonly available in supermarkets in either green (original) or red (with sun-dried tomatoes or red bell peppers) varieties, produced by major manufacturers or under a generic or cheaper brand. Cashew nuts, walnuts or Chinese pine nuts are often used instead of European pine nuts, because they are less expensive and have a similar texture (although not the same taste). Cheaper oils and other herbs, like parsley, may also be used to further reduce the price. In Singapore, an Italian-Peranakan fusion version called laksa pesto is popular. The recipe has the flavour of the local curry noodle soup, laksa but is made using the pesto method. *Named for the town of Cotija, Michoacan, where it originated, this is a sharp, crumbly goat cheese. It has been called “the Parmesan of Mexico” and is usually served over beans and salads. Put all ingredients into a food processor and pulse until creamy. 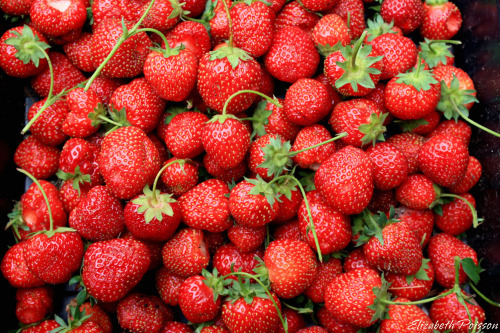 Maine Strawberries are the best!!! Pulse first three ingredients in a food processor until creamy, toss with strawberries and serve over a slice of cake. Toss the sliced berries with the pest and serve over a slice of cake! Ok so now you know how much I love pesto. Be creative and let me know what you come up with. I love to try new recipes. Thank you for reading my blog and if you do not follow us…click the follow button and never miss a post. Please let me know if you have a topic you would like us to feature!